Aksel Lund Svindal, of Norway, powers through a turn at the Abyss while training on the Birds of Prey World Cup downhill course Thursday in Beaver Creek. Friday: Downhill starting at 10:45 a.m.
Saturday: Super-G starting at 11 a.m.
Sunday: Giant slalom, starting at 9:45 a.m. and 12:45 p.m.
BEAVER CREEK — The word to describe the downhill course the world’s fastest skiers are racing on Friday may not even be a word. “Turny” seemed to be the description of choice for the 2013 men’s downhill course after skiers got a chance to preview it in training Thursday. With two weeks of World Cup racing at Beaver Creek beginning in November this season, the resort was forced to forgo “North America’s Downhill” — the normal men’s World Cup downhill course — for a course that included a portion of the women’s, as the task of preparing two completely separate downhill courses this early in the season simply wasn’t possible. A hybrid course was designated for both ladies’ and men’s competitions, comprised of the upper half of the new Raptor ladies’ race course and the bottom half of the traditional men’s Birds of Prey course. In the end, it will be only the men using the hybrid course as Beaver Creek crews were able to get the full-length women’s course ready in time for last week’s competition. 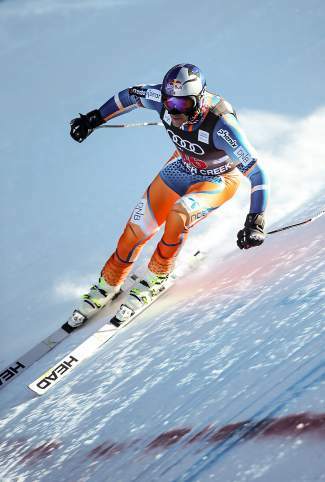 The winner of Thursday’s training runs, Erik Guay of Canada, said the course was indeed different than he was expecting. Sweden’s Aksel Lund Svindal finished second in the Birds of Prey downhill last year. He said while he loves the normal course, the hybrid is challenging, as well. Svindal said he was disappointed with his performance in Thursday’s training run, where he finished 23rd with a time of 1:44.54, and offered the following advice to the rest of his team after that run. The top performer on the American side, Travis Ganong, said the women’s course section will be a decider in the event.